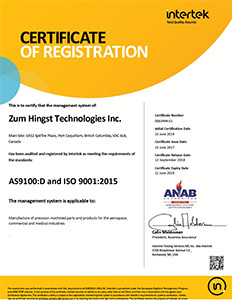 At Zum Hingst Technologies, our success can be attributed to the combination of traditional craftsmanship and state-of-the-art technology. As the first Computer Numerical Control (CNC) manufacturing company in British Columbia, Canada, we continue to lead the way by adapting the latest manufacturing techniques & methodology. We have gained much recognition for short run, on time delivery of customer components and assemblies. Our manufacturing process is CNC controlled using 3-axis, 4-axis and 5-axis capability. We make extensive use of computerization and lean manufacturing procedures. From planning through to shop control, our production systems provide accurate capacity and resource profiles, real time job scheduling, tracking and reporting. Our production management team is strong and have gained recognition as a low maintenance supplier. We focus our expertise in those industries where standards demand high precision and meet all the global quality requirements of the many industries we serve.